John says that he's not sure whether the stock is LNWR or not, but this might be worth a try. The only clue seems to be the hill in the background although a search of all the accident books John can find has failed to come up with any ideas at all. The post card gives no clue as to date. The photograph was taken on 5th July 1904, as a result of an accident between Tal y Cafn and Dolgarrog, the train being the 10.25am from Llandudno to Betws y Coed. The locomotive was no. 891 a 4'6" 2-4-2 Tank with seven six wheeled carriages all of which overturned. As luck would have it the weather on the day was bad and only six passengers were on the train, none of them receiving any injuries. However the the driver Charles Jones of Llandudno Junction Shed, was badly injured, but recovered to carry on working for the LNWR. His fireman, John Williams, was scalded and also suffered shock. The timings at the time of the accident were such that to cover the six miles distance in eight minutes required a speed of up to 60mph. As a result of the accident the timings were relaxed in the following year. At last I have been able to drive both up and down the Conway Valley, between Tal y Cafn and Dolgarrog and can confirm my suggestion that this photograph is as I had suggested previously. The only additional information that I omitted before, was, that it took eight engines to drag no. 891 free, and that it was turned completely round by the accident. 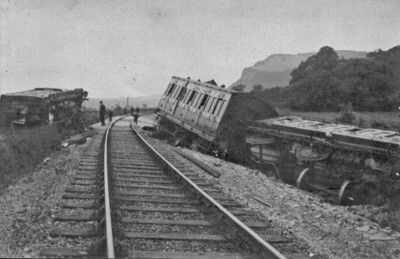 This is indeed the accident at Tal-y-Cefn, 5th July 1904. The 30ft 1in brake-third no.1288 (of 1890) was damaged beyond repair, and replaced by the unique 50ft 0in vehicle to D.340. The 30ft 0in first no. 2060 (of 1877) was also damaged beyond repair, and as it was in the supplementary stock was not replaced. Also damaged in the accident were 30ft 1in thirds nos. 581, 1920, 2107 and brake-thirds nos. 981 and 1298. These were repaired. Note that the train consisted entirely of Park's 30ft 1in stock except for the Richard Bore all-first, there being no 30ft 1in all-first design.